Pope Francis benefits from low expectations: Will pretty words become action? After John Paul II and Benedict XVI, two men who approached their papacies as unrepentant emperors rather than pastors, Pope Francis is certainly a breath of fresh air. No designer red shoes. The golden throne is in storage. Both nice symbols of a more humble man of the people. He hints at reform of the Vatican bank and of the Church’s view of divorced Catholics. He offers a wild guitar Mass on the beach in Brazil, complete with girls in bikinis. This guy is a rock star! He made headlines in the New York Times, on CNN, the BBC. FOX News is worried. He even made the Onion! With due respect, I don’t see what the fuss is about. I believe Pope Francis is benefiting from decades of low expectations. Benedict in 2005 wrote that homosexuality was “a strong tendency ordered toward an intrinsic moral evil,” and an “objective disorder.” That church document said that men with “deep-seated homosexual tendencies” should not become priests. Pope John Paul was unforgiving in his crackdowns on dissension in the Church. He banned the books of countless Catholic authors, a practice reminiscent of the Communists he so publicly attacked. He had plans to remove the legendary Archbishop Oscar Romero from office before he was gunned down by assassins, another symptom of JPII’s obsession with Liberation Theology and any other progressive movements in the Chrch. Both Pope’s were obsessed with sins of sexuality, except when it came time to ignore and hide sexual abuse in a clergy that was responsible for transubstantiation of the Eucharist. Reporters were thrilled last week when Francis walked to the back of his plane on the return trip from Brazil and answered any and all questions. He even thanked the reporter who brought up the homosexuality question. Such access was unheard of from his secretive predecessors. In John Paul’s time it was even a Vatican secret whether he wrote his encyclicals on a word processor or with a ball point pen. So what is Francis going to do next? He wields great power. Is he going to bring gay people into the Church fully, regardless of their behavior, just like heterosexual people, who act on their desires? How about divorced Catholics who remarry? Women who have abortions? Is he going to crack down on bishops who misbehave and treat human beings without charity and compassion? Until we see something of substance come of all this nice talk and window dressing, could it be that there are two people donning the miter, the Pope in Rome and Jorge Mario Bergoglio who goes out and speaks freely without substance or responsibility? The key word there is novelty. So far, that’s what the pope has been, a travelling novelty, making news for doing what his predecessors and anyone else who claims to be a decent person should be expected to do. Try not to judge others. Be humble. Don’t place yourself above. Serve others instead of seeking wealth. Don’t dress ostentatiously when others around you are struggling to get by. None of these messages are news. It seems Pope Francis is finally saying and doing a few things that should be expected of a man who follows an itinerant preacher who said prefer the poor and give up everything to follow him. The real news was made by Francis’s predecessors who were anything but examples of Christ-like behavior. Is it really news that Francis is so surprisingly human. That unlike JPII and Benedict he deigned to talk to the little people. News is doing the extraordinary, changing history. News is repairing, reversing wrongs made by those who came before, men who buried secrets so deep no one dared look for them. News is freeing people, turning great words into action. It is news when a humble man points out that the emperors wore no clothes. Pope Francis will make news when, like Jesus, he and all of his bishops welcome all people, no matter their sins, to the banquet. Perhaps Pope Francis is working his way toward the kind of greatness of a John XXIII, but he has a long way to go. 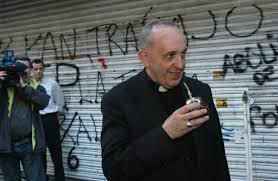 I am rooting for him, and hoping that Pope Francis and Jorge Mario Bergoglio will come together with heroic courage. In the meantime, for a family member on the outs who has been taken advantage of too many times, skepticism is healthy and warranted. Skepticism toward a Pope who seems to be saying all the right thing to charm the world and the media into believing his Church wants to change. And skepticism toward a media who doesn’t seem to know what a follow-up question is. This Pope says John Paul has closed the door on women’s ordination but then in the same breath says women need more of a role in the Church. That is not much different from what John Paul and Benedict said. He just says it more politely. One of these days Pope Francis’s travelling show is going to end and the words will need to become substance. Will he be a reformer or continue to spin pretty words around the same teachings of his predecessors? There is one reason for concern. Has anyone heard the hardliners, the old Vatican guard who hold tightly to a pure Church, grumbling about Francis’s unpredictable statements to the media? Could it be they know something we don’t? Could it be that Francis’s job all along has been to put a more palatable face on the Church…and that is all? Many an alcoholic has admitted to his family that he needs to stop drinking, that his old ways aren’t working, all with a smile on his face and a charming plea for a second chance. That doesn’t make him sober. I haven’t seen the first step yet.